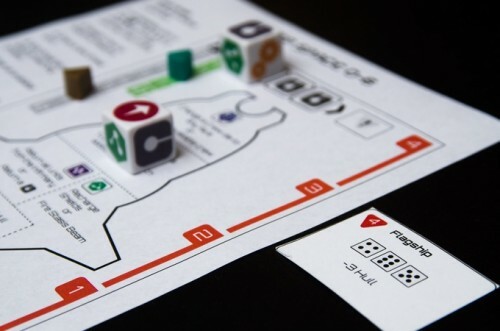 Deep Space D-6 is a solitaire worker-placement dice game inspired by choose-your-own-adventure books and early science-fiction RPGs like Star Frontiers. With a minimalist graphic design, the game has its player commanding a spaceship trapped in dangerous territory, fending off attacks, troubleshooting emergencies, and generally trying to survive until help arrives. Gameplay involves rolling the custom dice and allocating them to various crew positions. Monster Truck Mayham from Dice Hate Me Games is roll-and-move played in real-time. Fast as they can, players roll dice to race their trucks around the modular dirt-track board. Along the way, of course, there are cars to crush, slicks to escape, and buses to jump. The Great Dinosaur Rush is a game of competitive paleontology, where the players are as much concerned with recognition as scientific integrity. In the dig phase of each round, players collect bones, manipulate museums, and sabotage or even steal from other scientists. 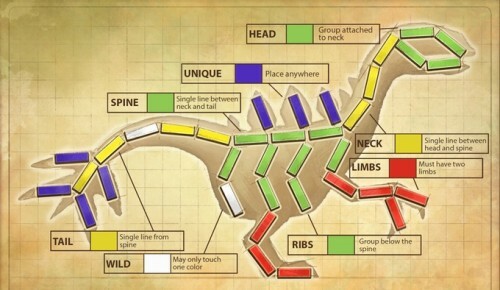 In the build phase, players assemble bones in to dinosaur skeletons. Matching recognized species is worth extra points but definitely not required to get ahead. Some of these games can be hit and miss. The great dinosaur rush from APE games seems very interesting. Which games? These specific games or board games on Kickstarter in general?